Would love to win that wire! You did a great job and I really like the tiara idea as well! great thought to embroider the grid. good job Lori! I know poor health can get in the way of creativity, it has for me my eye sight has gone down hill so much I can't see to do bead weaving any more, I can hardly see my larger components to make jewelry at all, But I am glad you were able to finish your pieces in time, I love the necklace! 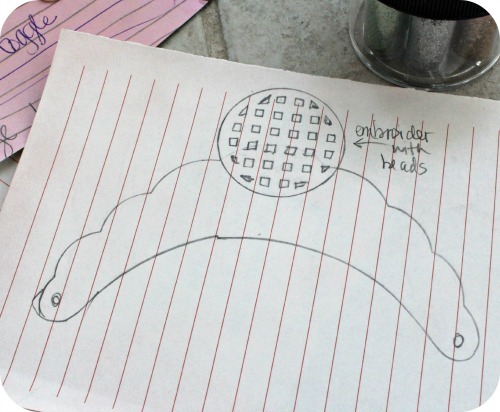 Love what you did with the grid, you totally rocked that whole design! Well done, looks like you had fun! Lori! I love what you did!!! xoxox jean!!! So pretty!!! As always!!! Awesome creativity and getting outside of your box! Glad you felt well enough to accomplish these. Hope you can have more better days! My favorite is the bracelet because I have a soft spot for Czech glass beads. I thought the other two pieces were genius creations though. I was wondering if you were going to try macramé?! These are just so creative Lori! I love the embroidered disk pendant, I love the tiara, you really went outside the box! You did an awesome job with your pieces, really love the bracelet. Your tiara was really a genius idea and think it would make a neat bib type necklace. Would love a chance to win the wire. VERY pretty Lori! I would have been scratching my head with those components too. You did great. the tiara is amazing and sooooo YOU! Wow! I think you have done a bang-up job. I especially love the brass neck piece, but then what you did with the Chinese knotting cord rocked and the sweet little swallow bracelet . . . I LOVE LOVE LOVE that first necklace so much - your embroidery is just fantastic...BRILLIANT! I would not have known what to do with the brass piece, either - you did fantastic! Love the lampwork beads you used - gorgeous colors! I loved reading your post today! Love Tiaras!!! I just adore the vintage look. The bracelet and necklace are gorgeous. Have a great week Lori. Your pieces all turned out great! My favorite is the bracelet. I like how you described your creative thinking. I LOVE what you did with the scalloped piece-genius! And the embroidered grid looks great! I like that your embroidered rather than just beading the grid. The "tiara" collar is great. If I want pieces of the metal to show I usually burn the paper with a lighter on the edges before I glue it down but that's a different look altogether and it's sweet the way it is. Once again, awesome job, Lori! When I first saw the pic of what you received, I was so intrigued to see with what you would do with it. Excellent job on all of it - but the bracelet is my favorite. What great pieces. Love what you did with the cord! Your tiara/necklace focal is amazing! i think it would make a stunning necklace. That was an adventure! Love how your pieces came out. These are all so very well done!!! I Love all of them. Each has it's own "specialness", I am so glad you had fun and did a little stretching!!! Great Job Lori!!! Have a Blessed day!!! I love each and every piece you created!! What a creative idea, the tiara. The bracelet is absolutely my favorite. Lori, I look at your jewelry and so often think, "that's the most beautiful jewelry I've ever seen -- Lori's so good!" and now today, you took it all to an entirely new level of sublime. You just blew me away!! Your grid embroidery is gorgeous -- completely brilliant!! The chain, the bead choices, the colorway -- outstanding. You have the most beautiful beads, and the patterns you created in all your jewelry for Beads and Baubles are inviting and enchanting, so wonderful to the eye! Art. I hope someday someday to be able to create as you do! It's all gorgeous! Great job Lori! Do I have to pick one favorite? I don't think I can. The tiara is quite inventive. They are all so beautiful. I love the bracelet the most! Wow! Your jewelry always amazes me and this collection is no exception. I can't decide which piece I like the most. Thanks for your hard work and each piece is so inspirational. oh, i love all three of these pieces! my favorite is the tiara, which is funny. because i'm not a tiara kinda girl. I must say I was eagerly awaiting your reveal and you did not disappoint! Along with Zach, I'm SUPER proud of you for going beyond your comfort zone and making all these pieces! I admit, even though I'm taken away with all your pieces, my favorite is the bracelet! I love how those blue ovals and the lampwork beads work together. 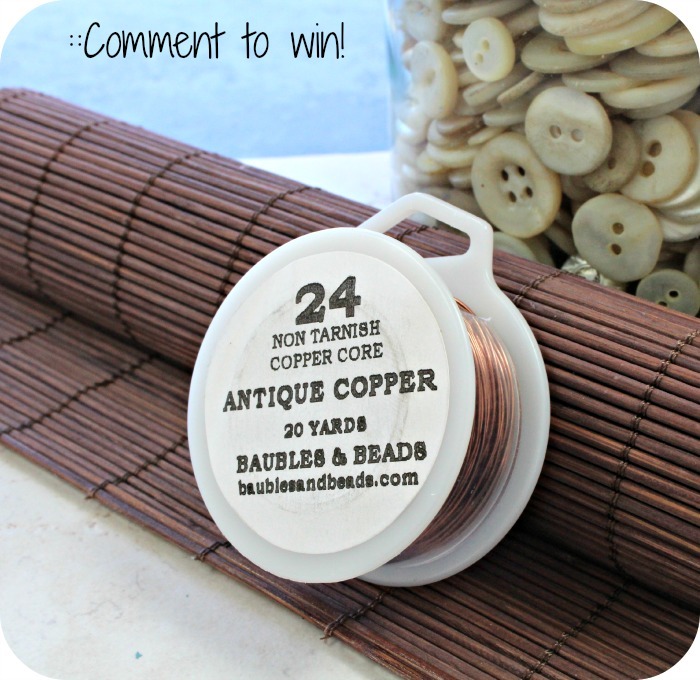 Copper wire (and copper coloring in general) is something in which I am just branching out and getting interested, so it would be awesome to win that! I knew you had it in you. You did fantastic. I truly love every piece. Yes, I had fun! 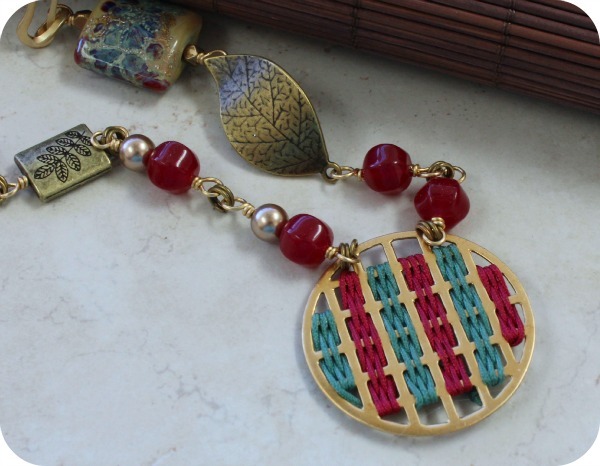 The embroidered grid is beautiful...the colors of the whole necklace are copacetic! Thank you for sharing this adventure. It's great to see you making jewelry again. All of your pieces are wonderful. The embroidered pendant necklace is my favorite. Lori, what cool pieces you made. I really love the way you stretched your limits with the first two. Both the embroidering and the mixed media of the second one are right up my alley and I think they turned out superb and very, very cool! Yup - you did go outside your zone! And you had fabulous results -- thanks for sharing the process. I always learn so much when people explain their thought process! You rocked your pieces! Great job! Pretty please count me in for your awesome giveaway! Thanks! Home Run! On all the pieces actually, but the tiara is super cool! Wow, What a challenge. Loved the woven brass, great idea. I just knew that you surpass yourself! I just adore the necklace. You are so amazingly creative Lori! I absolutely love the woven disk necklace to bits. Bright, bold and beautifully put together. And I would never in a million years have thought to use the big brass doohickey as a tiara. Inspired! 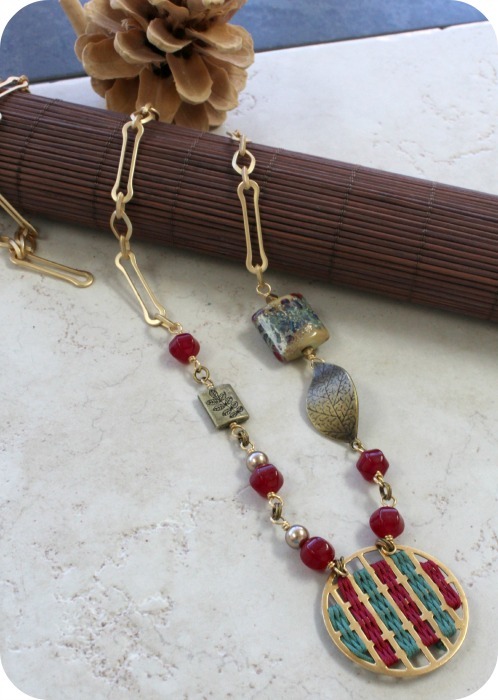 Love all three pieces, but am especially inspired by the weaving you did with the pendant. Your color style is great! 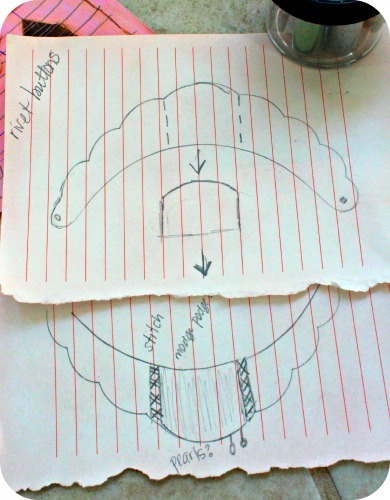 I do like Zack's idea for a tiara though I would have liked to see you go a little crazy and steampunk it out! There IS such a thing as a little steam, you know, a gear here, a cog there... That necklace is fantastic and my favorite piece. I just love those colors! Always love your Jewelery and so glad you will be blogging occasionally. I am undecided whether it is the brass necklace or the bracelet I like the best. I would love to win the copper wire. Thanks for the opportunity. I really LIKE that bracelet! Great job on the creativity. Thanks for sharing. 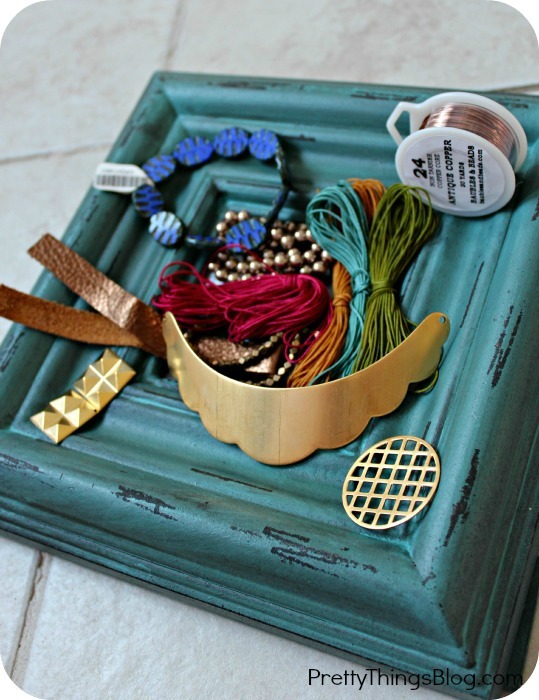 I am pinning the bracelet as beautiful inspiration, too. So gorgeous! 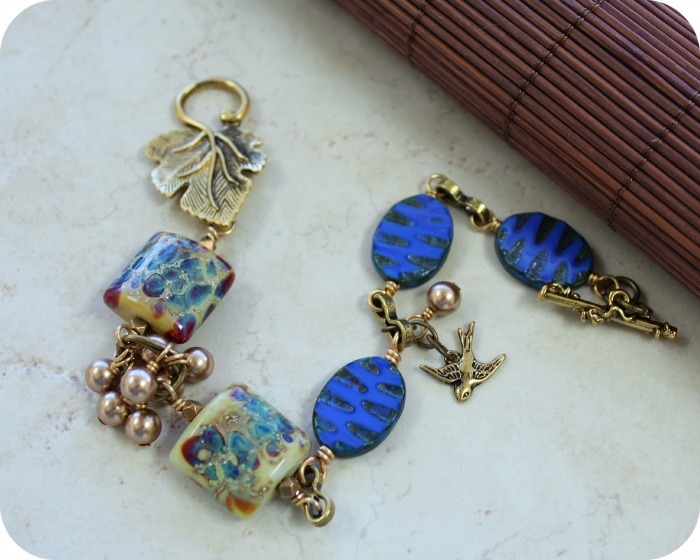 My favourite has to be the last bracelet, although they are all stonking pieces :-) Czech glass - lampwork glass - antiqued brass - how can it not be my fave though?! 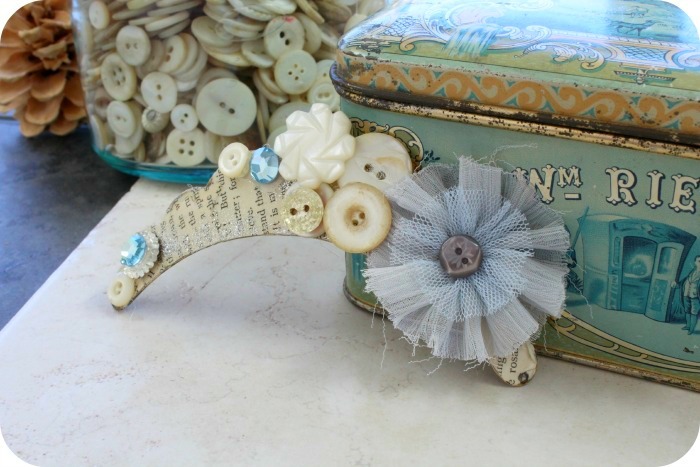 The tiara is beautiful too - I love it's vintage feel, the buttons were an inspired idea. And i LOVE the embroidered circle! Gorgeous!